I need to watch FB again. In fact, I'm teaching a course on literature about adolescence and I'm considering using it as a supplemental text. I loved it when I was a teenager, and I expect I'd see it in a whole different light now. "A student can’t give me a higher compliment than to tell me something I taught them was 'relevant.' 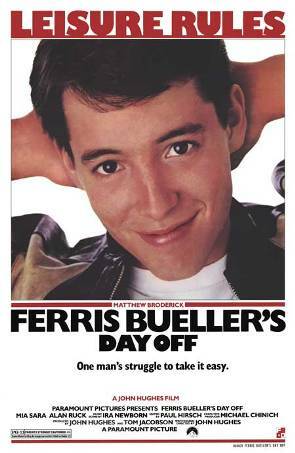 Perhaps if Ferris’s teachers had thought about that issue, he and his friends wouldn’t have had to take the day off to learn." This is the crux, I think. The film's not telling us that school is irrelevant, only that it can be. I think you would see it differently. The way teachers and authority figures are portrayed in John Hughes movies makes for an interesting study. Think of the principal in The Breakfast Club, too. Don't you think that every teacher believes that what they are teaching is relevant – either directly or indirectly? They probably do, especially since they're invested in their subject. On the other hand, I know that in the past I have been mandated to teach certain things I didn't think were all that relevant. We also have some teachers, and I've worked with them in the past, who might think what they teach is relevant, but they can't communicate its importance to students. The Ben Stein example is perfect for illustrating teaching a relevant concept in a way that no one finds relevant. I really hated this film when it came out – and I hate now. To me it is the anti-Carpe Diem movie. Rather than take what you have and seize the day with that – it seems to say abandon your world and find pleasure outside of that. Ferris will go back to school – he will spend most of his days in school – rather than finding the incredible, teaching, life-affirming moments in each day – in each class, he feels that he has to go outside of the life. Sadly, this is more like seizing the weekend, than seizing the day. I have always believed there is greatness in the everyday pattern of our existence. When I teach the Carpe Diem poets – and ask students what they think it all means – many of them ask if it means we should be drunk (high) and/or seeking other physical pleasures all of the time. I tell them (or rather I try to show them through the poems) that hedonism should not be confused with carpe diem. Unfortunately, for a generation that looks to Ferris Bueller, that confusion is ingrained. Really excellent point, and I can understand why students find it confusing. I admit the message in the movie itself is confusing. I don't find Ferris's statement that “Life moves pretty fast. If you don’t stop and look around once in a while, you could miss it" especially hedonistic, but his actions definitely are. Thanks for your comment on Facebook, too, Joe. Much appreciated, especially considering I wasn't feeling as coherent as I wanted to be while I was writing this. There are three movies that my Film Club insists we watch every year: Monty Python's Holy Grail, V for Vendetta and Ferris Bueller. Different kids every year, same movies. Five years ago, they wanted to know what I thought of kids skipping school and the lack of any redeeming features in the teachers in Ferris Bueller. We talk about good teaching and good learning for a few minutes every single time, too. But this past year, the major source of discussion was the tortured relationship that Ferris' best friend had with his dad. Times are changing, and this movie has become a touchstone for me in my relationships with my students. So after reading this with my husband and talking about how it's Cameron, rather than Ferris, who has any kind of character development (I mean, am I missing something? Is Ferris NOT a static character?) but Ferris is the one who can talk anyone into just about anything, which is a big part of why he gets away with so much… made me think of Tom and Huck. Tom's the lighter, more easy-to-like character; Huck is the one with depth, the one who goes on his own Hero's Journey. And also I think Back to the Future honestly looks at these issues and more, while telling a ripping good story to boot.